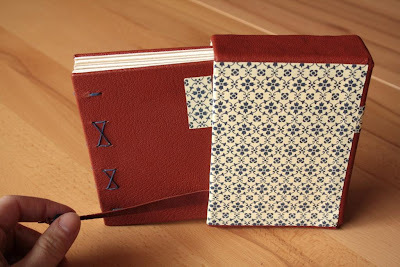 Hilke, also known as Buechertiger, created this journal and slip case for our recent swap. 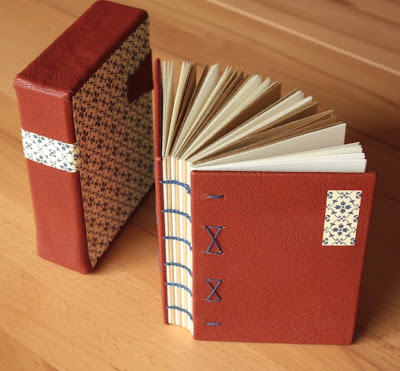 Hilke writes, "brown leather hardcover with paste-downs made of traditional Leipzig patterned paper give this journal a wonderful old world feel. This journal has a nice travel size, and sits in a slipcase for better protection. This case's spine is lined with the covering leather, and the sides are covered with the Leipzig paper. A strip of leather, attached to the slipcase and fitted with a glass bead, helps getting the book out of the case without strain on the book's binding. The books in this series of travel journals are numbered, this is number 10." Visit Hilke on Etsy, at buechertiger.etsy.com. WOW! This is a wonderful piece of work. Filled with admiration, Hilke! What a beautiful book! Just amazing!! I wish I could do Coptic even half as well...!! Beautiful book & case! Beautiful! Love the pattern and I too am envious!